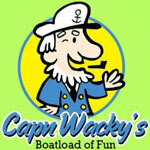 Cap'n Wacky's Boatload of Fun was created in 1999 by RJ White and me. 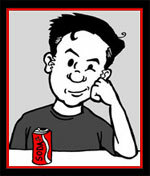 It has been updated with fresh comedy on a nearly weekly basis ever since. For the last several years, I have acted as editor and head writer of the site. There is a mountain of short comedy pieces written by me all over the site. and pretty much everything on The Unfortunate Page. "Tricks of the Trade", a macabre comic book tale, was featured in the fourth Issue of Myspace/Dark Horse Presents (illustrated by Katie Cook). It was lated printed in MySpace Dark Horse Presents Volume 1, along with work by Buffy the Vampire Slayer Creator Joss Whedon, Hellboy creator Mike Mignola, Eric Powell, Peter Bagge, Tony Millionaire, Guy Davis, and many others. Katie and I were interviewed here (with correct name spelling in the headline and super-rare collector's item alternate spelling in the article). There's a review here. 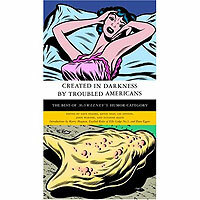 The Newest from Jokeland (co-written with RJ White) is a comedy list that appeared on mcsweeneys.net and was later published on actual paper in the book Created in Darkness By Troubled Americans. The City Desk: at RJ White's anthology of fake stories about a fake city: I have several contributions. Entwined is a comic I wrote, drawn by Katie Cook. End of the Scone Age is a short comic about dinosaurs in Calamity Jon Morris' The Calamity Project. worldfamousjunglecruise.com is my fan page dedicated to the classic Disney theme park attraction, including the whole story of how I got to perform as a Jungle Cruise skipper for a day. Haunted Trails and other live theatrical events: I've written the scripts for annual haunted houses or haunted trails in the City of Marshall Michigan since 1993 and for several other live, interactive events. See more about these in the projects section of this site.